All transactions are safe and secure with a reliable history in online purchasing behind each of our associates. Buy the Drago I Must Break You t-shirt to own Rocky clothing and merchandise. Ivan Drago spoke little English. However, in Rocky IV he does manage to utter one of the best lines in movie history, "I must break you." 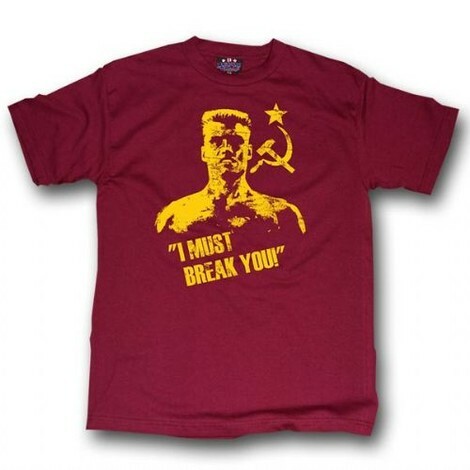 Now Drago's famous phrase is available on this maroon Rocky tee, which also features an image of the Russian champ. Available in five different sizes, this shirt will help scare off even the most fearsome bullies. In addition to the Drago I Must Break You tee above, browse the Rocky Clothing Gallery for more apparel like men's and women's clothes, kids shirts or hoodies.